Dear NFL coaches: If you're on the 37-yard line, go for it. Dear NFL coaches: If you’re on the 37-yard line, go for it. Photo by Dilip Vishwanat/Getty Images. Today’s NFL, unfortunately, is not as much about “Just win, baby” as “Just don’t lose.” There is a difference, and it’s not as subtle as it might sound. Modern sports statistics have come a long way toward answering questions that were once subjects of Monday-morning water-cooler conjecture. Should they have gone for two? Should they have gone for it on fourth down? The answers to these kinds of questions show how timid coaches really are. Winning is a stat, and the chance a team will win a game in progress is also a stat. Applied correctly, these kinds of numbers can be used to evaluate decision-making. It’s this kind of reasoning that allows us to analyze decisions that were previously considered purely the domain of the high priests of football gut instinct—the coaches. As it turns out, NFL coaches have not been trying to “just win.” Instead, their decisions indicate a clear pattern of merely delaying certain elimination from a game. Exhibit A from Sunday was the Cardinals’ bizarre 51-yard field goal attempt in the second quarter, on fourth down and 6, while trailing the Vikings by 28 points. Fifty-one-yard field goal attempts are successful only slightly more often than 6-yard conversions—55 percent of the time compared with 48 percent. And there is no universe in which being down by 25 points with the defense on the field is better than being down by 28 with the ball and a first down on the opponent’s 25-yard line. Advanced statistics not required. Exhibit B was the Eagles’ second-quarter punt on fourth-and-4 from Buffalo’s 37, trailing by two touchdowns. The punt resulted in a touchback, so the Eagles surrendered the ball in exchange for 17 yards of field position. The Bills’ offense could gain back that 17 yards (or even 30 yards, assuming a perfectly executed punt) in a heartbeat. The 37-yard line is the nadir of the NFL’s no-man’s land, where punts buy you very little and field goal attempts are poor bets. Statistically, there is almost no reasonable to-go distance for which offenses should not be going for the fourth-down conversion here. Statistically, the most egregious decision of the day was the Bengals’ field goal attempt on fourth-and-2 from Jacksonville’s 29. There were about 10 minutes to play in the fourth quarter, and the score was tied. Although it’s tempting to think that it’s clearly the right call because a field goal would put the Bengals ahead late in the game, there are two big problems with that idea. First, field goals are not automatic, especially 47-yarders. Second, being on defense with a three-point lead in the fourth quarter is about as precarious a position as possible. Sure enough, the Bengals demonstrated how fragile a three-point lead is. Following the field goal, it took the Jaguars all of three plays to score a touchdown. Then Cincinnati’s offense made it to the Jacksonville 19, where they faced a fourth-and-6. This time they went for it, easily converted, and retook the lead. The coaching mindset may be starting to change. Fourth-down attempts have been rising slightly over the past few years. But coaches have been inconsistent at best and confused at worst. 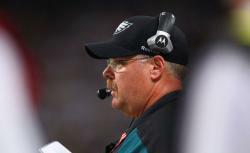 The same Andy Reid who elected to have the Eagles punt from the 37-yard line also had his team try a surprise onside kick to open the second half. Down by 17 points, it was more than prudent given the probabilities. It turned out to be a double-surprise onside attempt, so unexpected that it caught the refs unaware, before they had whistled for play to begin. Cincinnati’s Marvin Lewis, guilty of the worst strategic decision of the day, also made a bold and smart fourth-down decision in the second quarter, going for it with 6 yards to go from the Jacksonville 34. That attempt was successful, and the Bengals went on to score a touchdown. Sunday saw two fake-punt plays, one by the Steelers and one by Al Davis’ own Raiders. Both were successful and helped both teams win their respective games. I applaud the aggressiveness, but it highlights how timid coaches are otherwise. If a fourth-down conversion is strategically worth the risk of a special-teams trick play, then why isn’t it worth lining up for a conventional play on fourth-and-short when the probabilities are far better known and likely higher? When pressed by reporters on their decisions, coaches often hide behind their voodoo masks, citing the hocus-pocus of losing momentum or citing trivial previous events as evidence against taking strategic risks. Well, we didn’t pick up that third-and-short earlier in the game, so I decided against going for it on fourth-and-1. Those who decry statistics are often the first to cite a statistic with a sample size of exactly one.